At Destination Justice, we believe that if young people are given a platform for self-expression and creative proclamation, they can be the catalysts for change. This is why we launched the Youth Voice Contest as part of the Justice Matters Conference 2018. 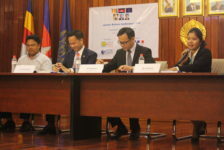 This event was co-organised with our partners at Transparency International Cambodia, and with the help and support from the European Union, the Swedish, and the French embassy. 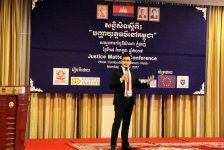 The conference took place on Friday the 7th December at the National University of Management, with the aim of facilitating dialogue between students, legal professionals and academics, on Justice in Cambodia. 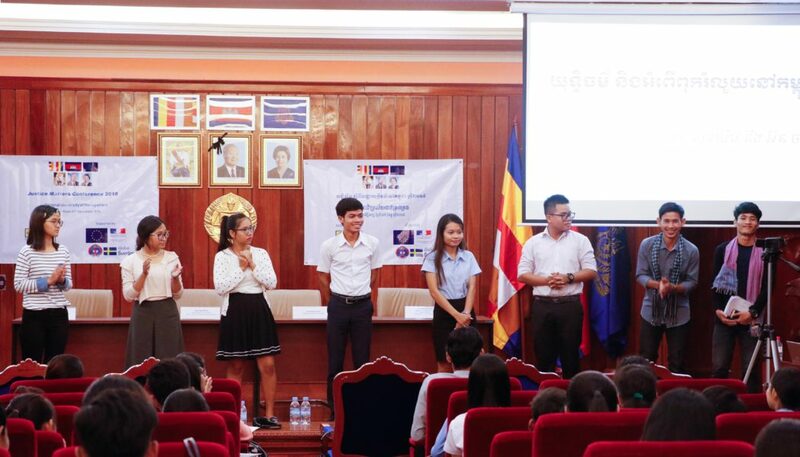 The Youth Voices Contest encouraged and enabled young Cambodians, 25 years old or under, to participate. 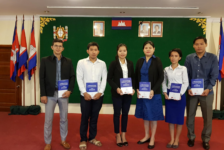 The contestants were invited to submit creative work, on the subject of ‘Justice and Corruption in Cambodia.’ They had the choice of submitting written work, of up to 5000 words, a combination of text and visuals on an A4 poster, or a short video of up to 3 minutes long. Prior to the conference, the competition was promoted through different mediums, notably on social media, and we were pleased to see high levels of general interest and engagement. Once the deadline had passed, we received a total of 8 written submissions on different topics. Our experts from the Review Committee proceeded to examine and assess the work, each giving their say and a score, to finally have all submissions ranked. 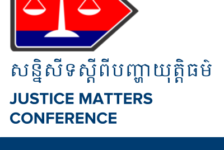 The participants were also asked to present their work to the public orally for 5 minutes each, during the afternoon session of the Justice Matters Conference – which was then followed by the public’s vote for their favourite presentation. The candidates took turns to present their work, full of energy and enthusiasm, all respecting the 5 minute guideline, and which was then followed by engaging, and sometimes challenging questions from the audience. The contestants were passionate about their ideas and opinions. Some used humour, and some quoted poets or inspiring historical figures to make their presentations all the more captivating. The questions from the audience allowed them to develop on certain concepts, but more crucially, allowed them to step into the shoes of professional orateurs, experiencing being probed and questioned by real legal professionals. Following the contestants’ speeches, the public voted on their favorite performance, which would then determine the public vote’s winner. Once the votes had been counted and the result unveiled, the contestants were called to the stage, one by one to receive their prizes. The Youth Voice Contest public vote winner was Sivutha Tan with his presentation on Mob Violence. Impressively, Sivutha Tan also won first prize for the committee-reviewed contest. A duo from Siem Reap, Chantha Orn and Khim, were rewarded with the second place, and Yeom Chanthy reached the third place. The results were tight, so all contestants received participatory prizes. The participants were very happy about the outcome and expressed their wish to share next year’s contest to their juniors and seniors! 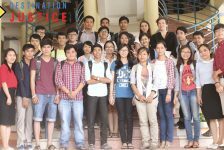 We are looking forward to next year’s contest and the continued amplification of youth voices in the discussion on justice in Cambodia!